For a classic take on a luxury brand, get behind the wheel of a new 2020 Mercedes-Benz GLE. This new Mercedes-Benz SUV, for sale at Mercedes-Benz of Omaha, comes with the performance, technology and safety technologies that truly set it apart from other luxury models. Turn heads as you take on Omaha streets or put its potent performance capabilities to the test when you trek across Nebraska highways. The 2020 Mercedes-Benz GLE release date has finally arrived. Experience its comfort firsthand when you schedule a 2020 Mercedes-Benz GLE test-drive at our Mercedes-Benz dealership near Bellevue, NE, and meet with our Mercedes-Benz financing specialists today! With a bevy of advanced powertrain options to choose from, the 2020 Mercedes-Benz GLE will make sure that every adventure is better than the last. Upgrade 2020 GLE trims to gain access to a potent 367-horsepower 6-cylinder turbo engine, and leave other drivers in the dust knowing that the new 2020 Mercedes-Benz GLE 450 4MATIC® can accelerate from 0-to-60 mph in just 5.5 seconds. 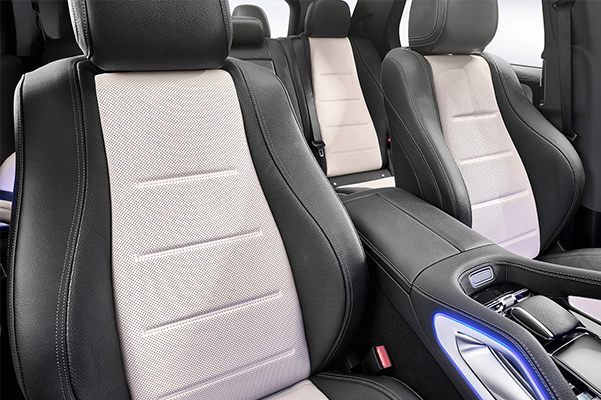 Review the 2020 Mercedes-Benz GLE specs to see that this new luxury SUV can reach an electronically limited top speed of 130 mph, while the 2020 Mercedes-Benz interior has all the perks to keep you comfortable at every turn. An all-new Mercedes-Benz User Experience system (MBUX) boasts next-generation technology including artificial intelligence that can learn your preferences as you drive, as well as enhanced navigation with augmented reality technology that ensures you'll never get lost again. Wondering what safety features the 2020 Mercedes-Benz GLE comes equipped with? A Blind Spot Assist feature gives you increased awareness as you drive, and Active Brake Assist can help your Mercedes-Benz SUV stop on a dime. The team at Mercedes-Benz of Omaha is excited to have the new 2020 Mercedes-Benz GLE for sale. With the 2020 Mercedes-Benz GLE release date in the rearview mirror, you can now take your drives from Omaha to Bellevue and beyond in the driver's seat of a 2020 GLE SUV. Contact Mercedes-Benz of Omaha with any questions and meet with our experts to shop your Mercedes-Benz lease and auto loan options.